I don’t know why I love books that make me cry so much. They leave me a little depressed afterward, but I just can’t help but love them! 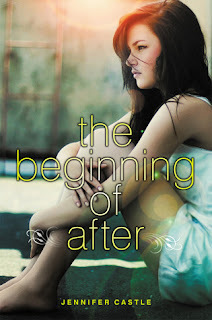 The Beginning of After had tears in my eyes almost every chapter. Maybe it’s because I am still dealing with my mother’s death, but I can relate to David and Laurel one hundred percent. The story is told from Laurel’s point of view and I found myself thinking that everything they felt and went through, was everything I had experienced. The only difference was that they lost more than a mother. It only took one night to turn David and Laurel’s life upside down. Both families were together having dinner at David’s house when they all decided to go out for ice cream. Laurel skipped on ice cream and went home to study and David went to a friend’s house instead. Then a little while later a cop knocks on door with the horrible news. I feel like crying writing this review just remembering everything she felt at that moment. Laurel was very easy to relate too. Despite everything that has just happened to her, she is still standing and trying to move forward with her life. There are times in the book where she struggles to do this, but in the end she was strong. David deals with his pain in a whole other way. They were very alike, but David’s way was to travel and not let anyone really close to him. I really liked both characters and feel that they were very believable. The only thing I would have liked was a little more romance between the two. It was cute reading e-mails back and forth and reading how their love developed, but I would have liked their romance better if they spent more time together and discovered each other more. Jennifer Castle did a number on me. She brought out so many tears and made me smile at the same time. This was one emotional rollercoaster with a good ending. David and Laurel both learned what “Love and Let Go” meant. If Jennifer Castle’s books are anything like this one, I am definitely buying them. A MUST READ! Another one for my watchlist! this book made me tear up a lot too - I have to be in a pretty rare mood to feel like reading books like this, but this one definitely caught me at the right time. I loved it as well! Thanks for the review! I can't wait to reaed it! What is it about grief that has everyone falling in love? Sigh... But I think I'm going to like this.